Why choose us? - Alloyweld Inspection Co. 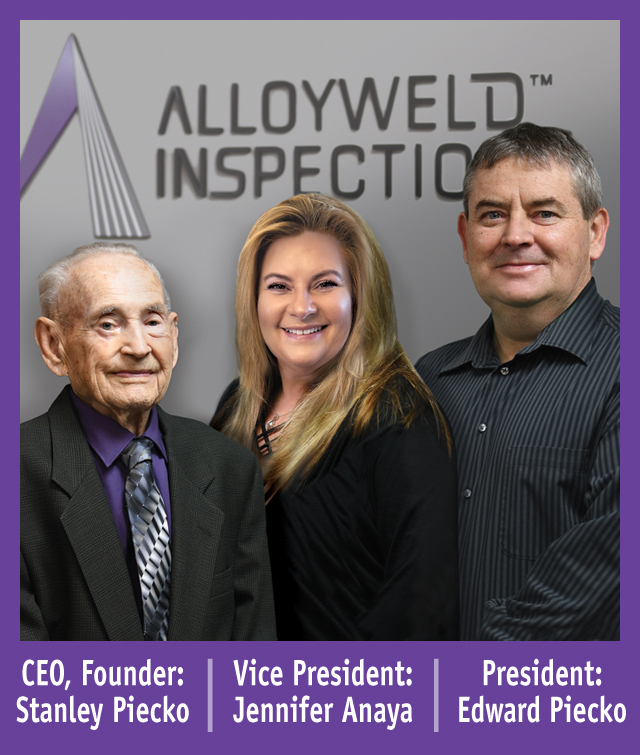 Since 1968, Alloyweld Inspection has been the leading resource for non-destructive testing, welding, brazing, and metal finishing to critical industries including aerospace, electronics, medical devices and forensics. We are and always have been a family-owned enterprise that takes pride in our accurate product analysis, precision welding and meticulous parts handling. Our accredited inspection lab and welding facility routinely exceed the standards of quality set not only by our clients, but foremost by ourselves. When integrity counts, you can count on Alloyweld. When it comes to the most accurate analysis of parts and products, Alloyweld Inspection is at the forefront of Non-Destructive Testing. We’re known world-wide for pioneering the use of cutting-edge technology that, today, features not only digital CR and DR, but also 3D Computed Tomography. We are the only inspection lab in the Midwest to own and operate a 3D-CT. This state-of-the-art technology provides precise results and unmatched amounts of data normally gained by traditional methods. Alloyweld – pushing the boundaries for ultimate accuracy. Achieving National Aerospace & Defense Contractors Accreditation Program (NADCAP) accreditation is a demanding process. That's why Alloyweld is proud to be among the first in the world to be NADCAP certified in CR and DR digital x-ray inspection - not to mention our NADCAP certification in welding, brazing and chem processing, magnetic particle, penetrant, ultrasonic and X-ray inspection. At the same time, we are an approved FAA licensed repair station along with approvals by OEM customers and aerospace primes. Alloyweld - where exemplary qualifications guarantee exemplary performance. The expertise of our seasoned staff of technicians and specialists is respected across all industries. Alloyweld personnel serve on the American Society for Testing and Materials International (ASTM) committee that writes the standards for digital X-ray testing. In addition, many white papers generated by Alloyweld team members have been published by the American Society for Non-Destructive Testing (ASNT). Our knowledge of codes, specification and standards within metal forming, machining and fabrication allows us to offer invaluable planning assistance and production guidance. Unmatched expertise and personal service offer two more reasons to choose Alloyweld.